The board certified surgeons at WestVet have extensive training and experience with TTA and other procedures used to stabilize the knee. 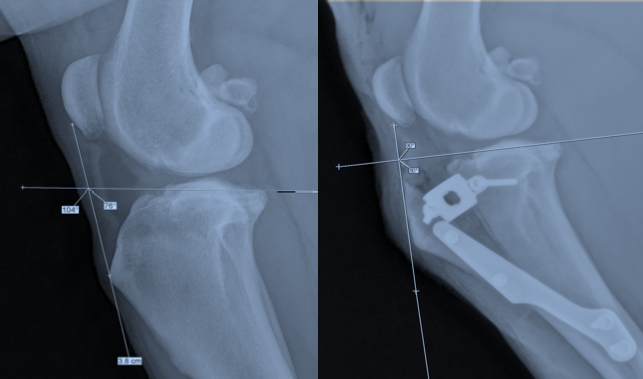 The cranial cruciate ligament (CCL) in dogs is the equivalent of the human ACL. This relatively large ligament located within the center of the stifle (knee), keeps the tibia and femur in alignment and prevents hyperextension and excessive internal rotation. When the CCL tears the joint becomes unstable, painful, and arthritic. This can subsequently lead to tearing of the cartilage between the bones (the meniscus). In most cases, CCL tears are caused by degeneration of the ligament. A tibial tuberosity advancement (TTA) stabilizes the knee by eliminating cranial thrust, thus negating the need for the CCL. To do this, the tibial tuberosity is cut and advanced forward until the joint forces on the top of the tibia are perpendicular to the patellar tendon. The bone is held in place by a metal plate, cage, and screws. The gap created will fill in with bone over several months, becoming a permanent method of fixation. Post-operative complications can be prevented by following the instructions of your surgeon. Complications are uncommon, and most can be easily treated. Potential complications include infection, delayed bone healing, implant failure, or late meniscal injury. Healing time is approximately 2-3 months. During recovery, it is imperative that activity is restricted to short leash walks only. Running, jumping, or off-leash activity can result in complications and delayed healing. Please see your family veterinarian for a referral for a consultation with a WestVet surgeon. If you have questions regarding your dog’s knee surgery, call us at 208.375.1600.